SINGAPORE — For almost 20 years, she could not hear properly. And the first time she saw someone playing the piano at five years old, she could only "feel" the melody through the vibrations in the air. Against all odds, Ms Parvinderjeet Kaur pursued her love for music, so much so that next February, she is expected to attain her diploma in piano teaching with the London-based Associated Board of the Royal Schools of Music. Now a part-time piano teacher, Ms Kaur, 27, earns about S$300 a month. She enrolled in the diploma course after receiving S$3,000 from the TODAY Enable Fund, which covers half her course fees. Upon graduation, one of her goals is to teach children with special needs how to play the piano. "They should not take their disability as an excuse or as a weakness," she said, adding that it could be "a strength" to help them strive to do better in life. Ms Kaur's own childhood was a frustrating one. She was bullied by her classmates who called her "stupid" in her first year in secondary school. She was born completely deaf in her right ear, with partial hearing loss in her left ear. When her mother was carrying her during pregnancy, she contracted Rubella, or "German measles", and the baby (Ms Kaur) had a high risk of being born with deformities. When Ms Kaur was three years old, doctors told her parents of her hearing impairments, but they did not immediately get her hearing aids because her father could not accept the diagnosis. He held out that her hearing would be normal by the time she was seven. When Ms Kaur turned six, her mother insisted that a hearing aid be fitted in her left ear. That was the first time the girl learnt how to speak. Two years later, she told her parents that she wanted to learn to play the piano. Ms Kaur said that she was inspired by Soka Gakkai International president Daisaku Ikeda, who had moved her with his piano-playing when he visited her kindergarten in 1995. "I practised very hard to make up for my hearing impairment. I did not realise then, but that was the turning point in my life," she said. She never missed a lesson, despite the stresses from her mainstream education which led to frequent asthma attacks; her move to Melbourne, Australia, to complete her high school education; and that she could only hear in one ear. She was hoping to get a degree in music, but she did not get any offer despite her applications to multiple universities in Melbourne. Determined "not to let this handicap affect my studies", Ms Kaur went for a S$14,000 cochlear implant surgery in her right ear in 2009. Earlier this month, she sat for the Grade 8 piano theory examination — her third attempt. Her never-say-die attitude and willpower have kept her going, to make a career out of teaching music. 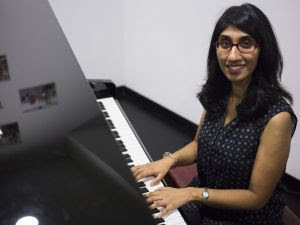 Since late last year, Ms Kaur has been guiding children with autism, by sitting in at piano classes at Very Special Arts Singapore, a charity that supports people with disabilities through the arts. Previously, she taught English, mathematics and the syllabus on moral and character values at Canossa Convent Canossian School for the Hearing Impaired for a year. Of the students she has met, she said: "I don't see their disability. I see their potential. I hope more of them can fulfil their dreams, create value in their lives, and make full use of their talent to contribute to society." * Support the TODAY Enable Fund for the special needs community. Find out more via www.todayonline.com/enable.